Dentures, commonly known as “false teeth,” are prosthetic devices that are constructed as replacements for missing teeth and surrounding tissues. They can greatly help to improve a person’s smile. Today, there are different denture designs available (some which rely on bonding or clasping onto teeth or dental implants), but the conventional dentures that everyone is most familiar with are removable. Of these conventional dentures, there are two types to consider: complete and partial. Complete dentures are used when the patient is missing all of his or her teeth, which may be either “conventional” or “immediate.” Conventional dentures are made after the teeth have been removed and the gum tissue has begun to heal. They are ready for placement about eight to 12 weeks after the teeth have been removed. 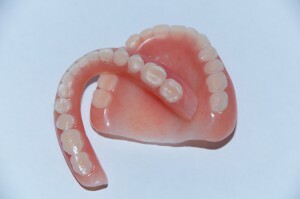 Immediate dentures, on the other hand, are made in advance and can be positioned as soon as the teeth are removed. They require more adjustments to fit properly during the healing process and should really only be considered a temporary solution until the conventional dentures are prepared and ready to place. Partial dentures are used when some of the patient’s natural teeth remain, but there are those missing on a particular arch. Fixed partial dentures, which are also known as “crown and bridge,” are made from crowns that are fitted on the remaining teeth, in which they act as abutments and pontics made from materials to resemble the missing teeth. Although fixed bridges are more expensive than removable appliances, they are more stable and natural-looking than complete dentures. Unfortunately, as people get older, the possibility of tooth loss increases. This is because many individuals are not conscious of their behavior or have a lack of concern regarding their oral healthcare. That said, certain factors such as poor oral hygiene practices, bad nutrition habits, and smoking are the leading causes of tooth loss. Fortunately, dentures offer individuals a solution for this problem, as they have become a standard choice for patients who desire a new set of teeth. This type of prosthetic device is crafted and customized to perfectly each individual’s mouth. Not only do dentures offer an aesthetic improvement, there are physical benefits as well. When a person has no teeth to support the jaw and gums, the skin can actually hang and sag, potentially affecting his or her ability to eat and speak. Dentures may greatly help preserve a patientâ€™s quality of life and overall happiness. Even if dropped a few inches, dentures may break – they are very delicate. You should always stand over a folded towel or a basin of water when handling them; and when not wearing your dentures, be sure to keep them steer clear of children and pets. Dentures should be treated like natural teeth in that they should be brushed daily to remove food deposits and plaque. Brushing also helps to prevent dentures from becoming permanently stained. It’s best to use a brush that is specially designed for cleaning dentures, or a toothbrush with soft bristles Hard-bristled brushes must be avoided, because they can cause damage to the dentures. Inland Empire denture dentist Dr. Naik can discuss which cleansers are best to use, and how to properly clean these devices. The alternative to dentures are dental implants, which can be used to support permanently cemented bridges. For some people, the downside of implants are that they cost more than dentures. On the other hand, however, implants and bridges are known to more closely resemble the natural feel of real teeth. It is important to share your concerns with Dr. Naik, because not every individual with missing teeth is a candidate for implants. He will help determine which treatment is best for you. In order to learn if dental insurance providers cover some or the total cost of dentures, you will need to contact your insurance company.